I've continued to follow my Real Life self-improvement plan of the Atkins low-carbohydrate diet, and exercise. (See my post, "Losing It.") It's continuing to work, too! In spite of various holiday indulgences, I've lost about 14 pounds from when I started back before Thanksgiving! But today's post isn't to brag on myself. Really. It's about my (and, probably, your) unhealthy sedentary lifestyle. We spend too much of our time sitting in front of computer monitors! And that can lead to problems. I've even heard it said that "sitting is the new smoking." 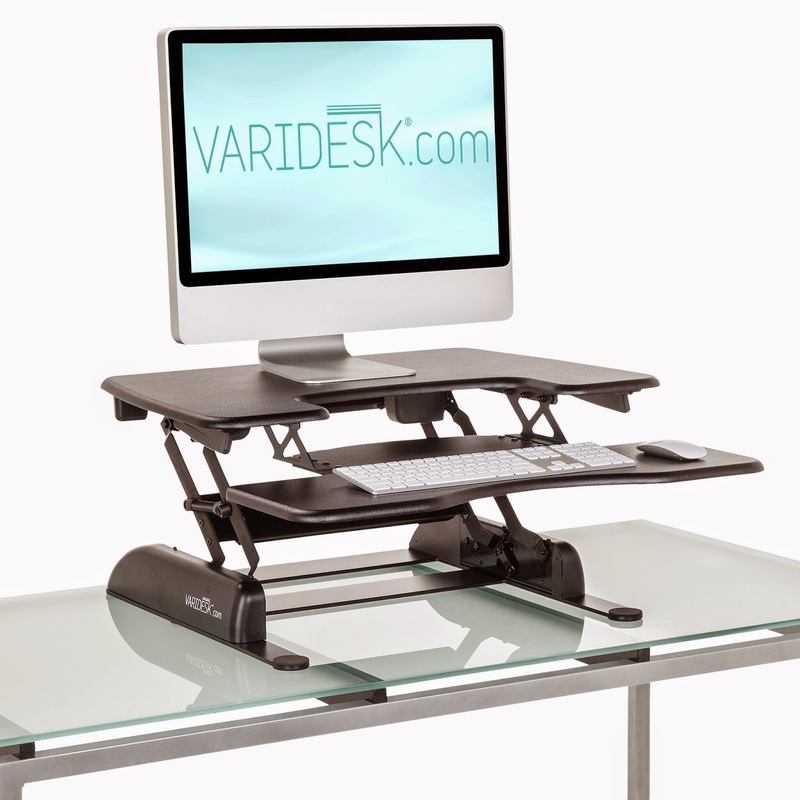 Get up out of that ergonomic seat every half hour or so and walk around for a few minutes. If you're even more motivated, get yourself a computer workstation with adjustable height, and spend more time standing up while working at your monitor. One example is shown in the picture below. If you, like me, are subject to occasional backaches, here are some simple exercises you can do that will both provide some immediate relief and give your lower back muscles a gentle workout. Lie flat on the floor, with your knees slightly elevated and the soles of your feet on the floor. Rotate your pelvis, pushing the small of your back flat against the floor. Hold for a slow count of 5. Release. Do 10 repetitions. Bend your right leg, lifting your knee to your chest. Grasp your leg with both hands and pull it up and against your tummy as far as you can. Hold for a slow count of 5. Release and extend your leg out straight, parallel to the floor. Repeat with the left leg. Do 10 repetitions. Bring your right knee up and to the left, rotating your pelvis to the left, while keeping your shoulders flat against the floor. Hold for a slow count of 5. Return your leg to the floor and repeat with the left leg, rotating your pelvis to the right. Do 10 repetitions. Repeat the above sequence three times. If you simply can't bear to leave Second Life long enough to do your Real Life exercises, find a gym and park your avatar on an exercise poseball while you take your RL health break!